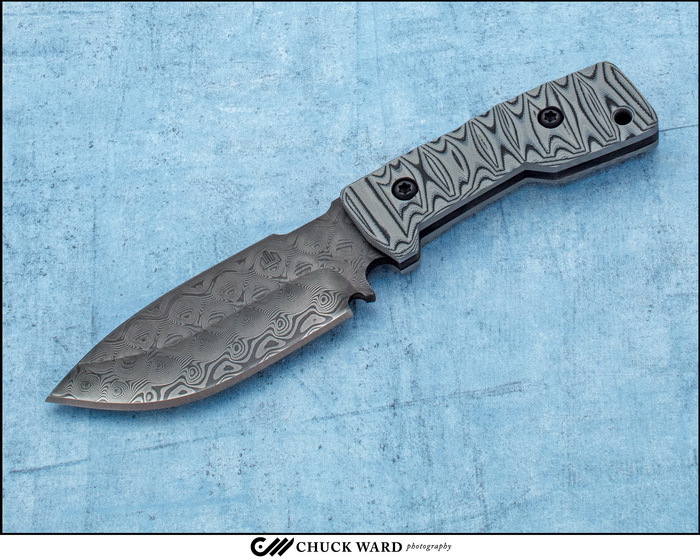 Maciej Szczerbiak has crafted a hefty tactical fixed blade, his full tang TCFM Model with Gaston Glock Leo Damascus steel made from the gun barrel of a German Leopard main battle tank. The hand;e is sculpted black/green G-10. Crusader Forge Knives are custom tools designed and hand made by Maciej Szczerbiak. Custom knife maker since 1996. Maciej has been in the Special Operations field since 1989. His experience includes working with numerous high risk security units in Europe, the Middle East and the US. He is an internationally certified Yacht Helmsman, with maritime background including Trans Atlantic and Pacific Racing. Maciej is also a nationally certified Law Enforcement Sniper Instructor, NASTI certified SWAT Rappel Master, Certified Diver and an EMT, wilderness medicine instructor, currently volunteering his services as a Fire Chief for Dammeron Valley Fire and Rescue. Working as a Range Master for one of the biggest US based Firearms Training Schools. Maciej trained over 12,500 military, law enforcement, federal and civilian students in the fields of Rapid Deployment, Precision/Counter Sniper Operations and Force on Force Training . Unique experience as an operator as well as an instructor allows Maciej to gain knowledge and understanding of practical design and deployment of Tactical Edged Tools.